Maria Semenenko, an internally displaced Ukrainian refugee from Donetsk, attends the World Refugee Day celebrations in Kiev on June 20. 'Internally displaced persons' struggle to find new homes and jobs in their own country. Semenenko, now 18, is from Donetsk, the still-burning hot spot of the war between Ukraine and Russian-backed rebels. The conflict has claimed over 9,400 lives since 2014, according to the UN High Commissioner for Human Rights. Despite the fact that there's a nominal ceasefire in place, military and civilian casualties continue to mount in eastern Ukraine, the UN High Commissioner for Human Rights says. The war, along with Russia's annexation of Crimea, has forced more than 1.7 million people like Semenenko from their homes to other parts of Ukraine. Many have gone to fairly close cities in the east like Kharkiv and Zaporizhia. Smaller numbers have gone to cities like Lviv in western Ukraine, more than 1,100 kilometres away, while others have gone to smaller cities and towns all over the country where they have friends and family. 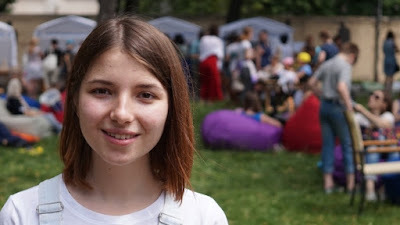 But many, like Semenenko and her family, left everything behind and settled in Kiev, Ukraine's capital and largest city of almost three million. "I like singing," she says at Kiev's World Refugee Day celebration on June 20. She used to sing and play a bit of guitar with her friends back home in Donetsk. "But when I got to Kiev, I didn't know what to do," she says. "I didn't know a lot of people here." But last winter Semenenko found out about a talent show an NGO was putting on for young internally displaced persons (IDPs) like her. She applied, auditioned and was accepted. "I've had some good luck," she says. But she knows not everyone is as lucky. Few jobs for refugees Semenenko's parents have found work in Ukraine's competitive capital city. But according to a recent survey by the International Organization for Migration (IOM) mission in Ukraine, fewer than half of such families in Ukraine even have regular income from employment. Even those who do can't manage to pull in very much. According to the IOM's survey, 59 per cent of internal refugees made less than CA$68 per family member per month. "The general level of well-being of most IDPs is quite low," says Manfred Profazi, IOM Ukraine's chief of mission. Some assistance is available from the Ukrainian government: CA$20 a month if a refugee is able to work and CA$46 if not. But refugee activists worry that new Ukrainian government rules and "monitoring commissions" will take these benefits away from the most vulnerable refugees like the elderly and disabled. "For people who live in poverty, on the very brink of survival, these small subsidies mean a lot," activist Andriy Timoshenko told the Kiev Post last week. "They don't have anywhere to live or anything to live on." From Syria to Ukraine Assad Hawlkat might have a place to live, but it's not where he wants to be. A Kurd from Kobani in northern Syria, Hawlkat left home several years ago to study at a university in Luhansk in eastern Ukraine. He earned an undergraduate degree, got married and was working towards a graduate degree when Russian-backed rebels seized Luhansk. "In 2015 they started saying they might have to send all the international students out because of the situation there," he says. He ended up going back home to Kobani, itself recently liberated after a long siege by ISIS. Hawlkat, a fervent painter, didn't last long back home. Extremists threatened him after a small exhibition of his paintings earned their ire and soon after he came back to Ukraine to pursue his graduate studies in Kiev. After his parents told him there was nothing to come back to in Kobani, Hawlkat applied for refugee status in Ukraine. But he can't go back to Luhansk, where he'd rather be. His wife is there but can't leave because she's looking after her ill mother and grandmother. As a refugee claimant, he isn't allowed to get through the front lines to visit. "I have all the photos to prove my story but they say no," he says, frustrated. But for Hawlkat, art is his outlet. He displayed some of his paintings at the World Refugee Day celebration. His paintings are visual odes to what he's lost and what he hopes to get back. Some of his pieces are based on photographs, including of his own war-torn hometown in Syria. Others are abstract pieces, from multicoloured swirls of oil to flowery yet fiery electrocardiograms that express emotions he can't put into words. "As an artist, I'm burning from the inside for my paintings," he says. "Value peace, all that you have," she says. "Because just one time, you can lose it all."